What Milage Would You Accept To Get Your Elio? Discussion in 'Elio Drivetrain' started by Tre', Oct 30, 2018. I know what was promised but what milage would you be willing to accept and why? Would less than promised be to get higher power? Get your Elio quicker? Or at all? I would probably be happy if it got 45-50 mpg if it meant I would actually get one. I had a Geo Metro 3 cylinder stick shift I purchased new and the wife and I had a contest to see who got the best highway milage. She won at 51 but I was a close second at 49. I would be Ok with that in an Elio IF I could actually get one! My Prius gets 55 mpg and has a huge amount of storage. Sure it cost more, but I also get a whole lot more car. Bought this because I could not wait on Elio. For me the Elio would have to get the full 84+ mpg. For me, depends on the size of the gas tank. If they stick to the proposed 8 gallon gas tank, 30 MPG would be fine. As long as I can get around 250 miles or more on a tank I will be happy. Both of my current cars need to be filled around 250 miles so that seems like an acceptable distance. Any less and you are always looking for a gas station. But I know that I am an odd duck regarding the Elio since I am not after it for the fuel economy but more the driving experience. I think it will be a blast to drive with the cockpit style interior! The more usable power I can get in it, the better. Then you must be thrilled for the increase to +/- 110hp. Definitely! Hopefully it will not be too much effort to get wider tires in there. My assumption is we will have to go with the open "retro" fenders to do so. I bet the 135/80r15s that Elio is having Continental make use a pretty hard compound for higher gas mileage. If so, doubling the power would spin the crap out of them Well if you turn off traction control, that is. Just don't care about the mileage, get it built. I'll buy the gas and if it don't like the mileage I will pull the engine and drop a 4cyl diesel in it. Just build it . Fine tune the mileage stuff latter if must be. Don't care about high HP. I can go fast enough. A few miles per gallon less than promised would not bother me. What I wish is it had more trunk space. Squeezing the last drop of high mileage won't mean much if I have to leave it home and drive our SUV because we can't get the groceries in the back of the Elio. I proposed a roomier trunk design quite a while back. 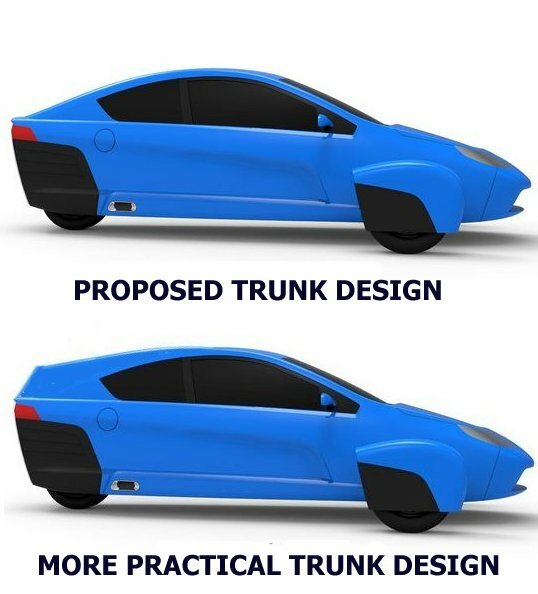 It would be an easy modification to make before production starts and, I suspect, would result in more sales, but I suspect the Elio team doesn't want someone to tell them what to do. After all, what do I know? And here it is,... again, damn it ! At this point I really don't care. I bought in just to have a fun car and a conversation piece. I think 50 mpg is easily reached and I would be okay with that, but I think they are much closer to meeting their goal with about 75 to 80 mpg. Either way, just produce. Sidecar Bob, ABC123 and Trusting like this.